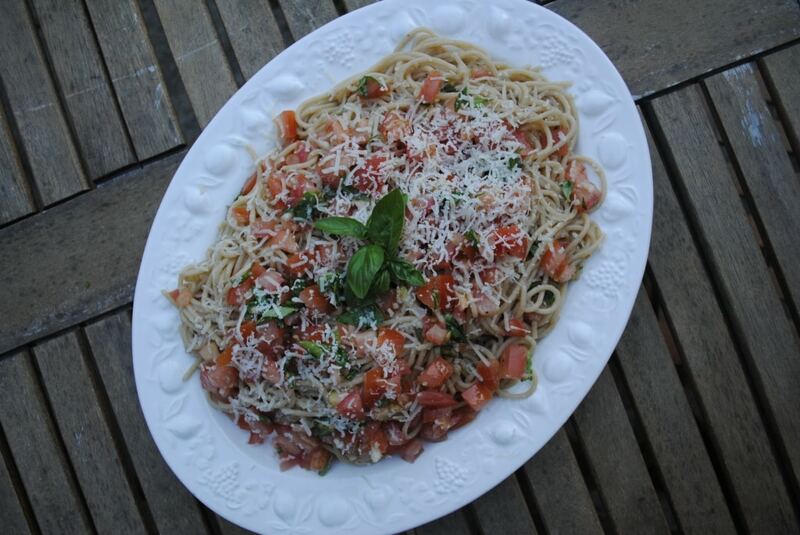 Tomato and basil is a perfect flavour combination and it works so well in this light and delicious Tomato Basil Pasta. Ready in under 15 minutes. It seems that Summer is definitely here and with a heatwave due here in the UK, I thought a delicious summery recipe would be appropriate. This is so quick and simple to make, that it is ideal if you are having people over for dinner as you can spend more time socialising and less time in the kitchen. It is ready in the time it takes for the spaghetti to cook, as all that needs to be done after is mix everything together and serve. It is also really cheap to make as well, with tomatoes being in season at the moment and being at their most delicious. I imagine that this would be the kind of dish that I would throw together if I had unexpected guests. But then, does anyone have unexpected dinner guests? I can’t say that I would just turn up at someone’s house at dinner time and expect to be fed, but I might start doing that. I am not sure there is a better food combination than tomatoes and basil, although I think I have also said that about orange and chocolate, cucumber and dill and cinnamon in pretty much anything Christmas related. A couple of birthdays ago I got a book about food combinations that is really interested. I have had a flick through, but not had a proper look yet. It is not the kind of book you would sit down and read cover to cover and I have around 50 books in my “to read” pile. Must make more of an effort to read. Anyway, tomato and basil – amazing combination. They bring out the best in each other and providing you get good ripe tomatoes, it can take regular spaghetti to a delicious dinner in minutes. Add the spaghetti to boiling water and simmer for 12 minutes. Drain the spaghetti and put back in the pan and add the rest of the ingredients, except the parmesan. Mix well. Put in a serving dish and sprinkle over the parmesan. What is your favourite summer meal? Leave a comment below. If you want to check out some more healthy dishes involving tomato and basil, take a look at this roasted tomato and basil filo quiche from Feeding Boys and a Fire Fighter, this tomato, makerel and chick pea risotto from Fuss Free Flavours and this roasted tomato, red pepper and chorizo soup from Fab Food 4 All. yum! your right about this being perfect for summer.. looks light and delicious. thanks for sharing the great recipe! It’s all about the light meals at the moment. 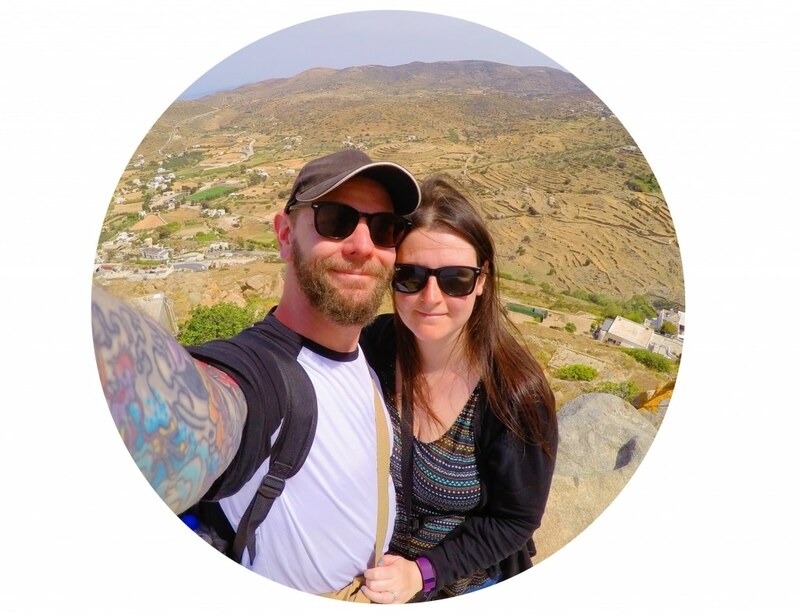 Hi 🙂 I love what you do here and have nominated you for the Very Inspiring Blogger Award. 🙂 check out my latest blog post for more info! Tomato and basil go together for me like wine and ANYTHING. I could eat it everyday. 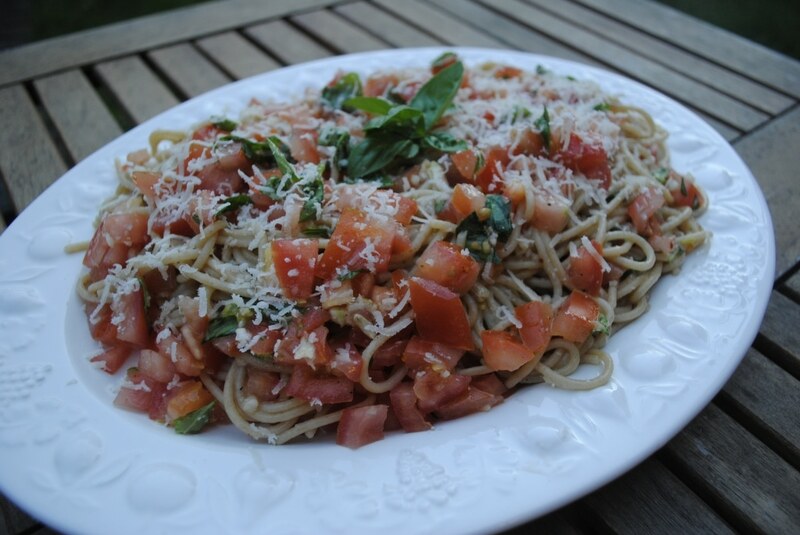 It looks so great in this spaghetti and you’re right it’s great for summer! Haha, wine does go with everything, right? 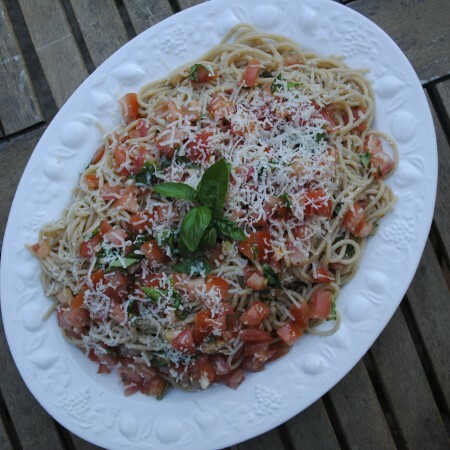 Love all the fresh tomatoes and basil in this spaghetti Dannii. It looks so summery and fantastic! I sniff my herb plants too. No shame in it! NYOM NYOM NYOM!! Another tasty recipe for me to try! Healthy and pasta is the best combination. This is what my family eat all the time when it gets to summer so delicious sand filling and so simple! I am all about the simple dishes at the moment. OH MY goodness this looks so fresh and delicious!! 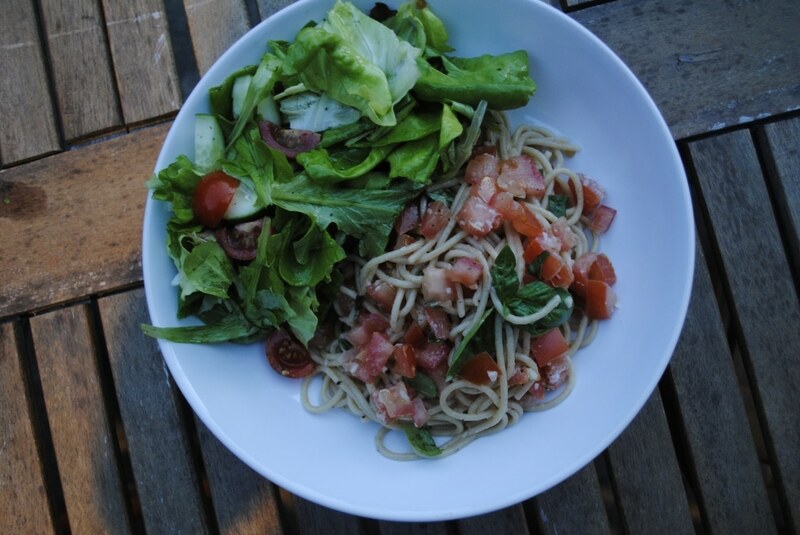 Lately my summer dinners have been very light and usually fruit based, but I would totally get down on this spag! I have been eating a lot of fruit at the moment too. It is too hot to eat much else. YUM! What a fun recipe!! Perfect for summer time! So healthy, fresh and delicious! YUM!!! This does indeed look perfect for summer, and for the current in-season vegetables. Less time in the kitchen is good on hot nights, too! It is so hot, isn’t it! I just want to get in and out of the kitchen as quickly as possible. Lovely, full of flavors and other good things! Oh yes, it is all about fresh tomatoes in the summer. Lovely! One of the lessons I learnt in Italy is that less is so often more. Great quality ingredients and simple flavours. Yes, that is definitely something I learnt when in Italy too. I shall be sharing lots more quick recipes soon, so keep an eye out for those. This looks delicious- the perfect summer dish. There’s just something about tomato and basil that makes me think of sunshine! It is the perfect summer combo. Perfect timing because we have both basil & tomatoes in our garden! This looks simple & refreshing. Yum! We have never had much luck with growing tomatoes. Hopefully next year.